What does this surprising new guest star mean for Agents of SHIELD? When Coulson and his team return in a few weeks for the première of Season 2, they'll be alongside a familiar, yet unexpected face. 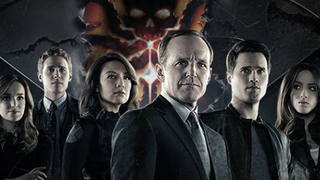 Find out who after the cut, and what it could mean for Agents of SHIELD. Presumably Peggy will be showing up in a flashback sequence to SHIELD's history, but we could also potentially be seeing an elderly version of the character meet up with Coulson and friends, similar to her appearance in Captain America: The Winter Soldier. The appearance, of course, is to tie in with Atwell's own spin-off series, Agent Carter, which will run in the Winter during SHIELD's mid-season break. But why is Peggy going to show up in Agents of SHIELD? We don't know for sure, but if it's aflashback sequence, maybe Agent Carter discovers something that impacts upon Coulson's team in the present - and maybe it could have something to do with Hydra's infiltration of SHIELD in its earliest forms. And will this be the only time we see her before Agent Carter starts? Could flashbacks to Peggy's adventures become a thread throughout Agents of SHIELD's first half-season, something to be picked up when Agent of Carter begins to air? We'll find out more when Agents Carter and Coulson return in Agents of SHIELD on September 23rd, on ABC.